Debunking Myths About Blindness “You don’t have to yell, I’m not deaf,” Michelle Friedman says, debunking myths about blindness in the upcoming Nshei Chabad Newsletter, on newsstands early next week. The blind do not touch people’s faces to know what they look like. And blind people can travel. Michelle visits Israel frequently to visit her son, daughter-in-law and grandchildren in the Holy Land, enjoying hikes and even a hot air balloon ride. Words like “saw,” “look” and “watch” don’t offend—she uses them too. Michelle’s path to acceptance of her situation hasn’t been challenge-free. Diagnosed at eight with uveitis, a condition that causes vision to deteriorate, Michelle went through multiple surgeries to maintain her sight throughout her school years. Her parents hired tutors to help Michelle keep up with schoolwork at the Ida Crown Jewish Academy in Chicago. Driven to achieve the same academic goals as her sighted peers, Michelle says was “angry at her parents and angry at G-d for giving me this burden I couldn’t understand.” In denial about the severity of her condition, Michelle refused to master Braille. Various surgeries helped maintain sight in one eye, as she finished school and married her husband Robert, an architect. Robert knew about her condition, but, like Michelle, never believed his wife would face total blindness. 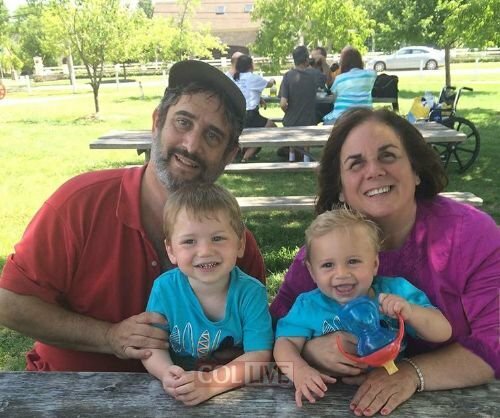 Michelle still had sight in her left eye, and though she couldn’t drive, her childhood friends invited her family for Shabbos and made sure to include Michelle’s two kids in their carpool schedule. Meanwhile, Michelle participated in school and community committees, happy to serve the warm community of Skokie, IL, where she was raised and later settled with her own family. “We did everything other families did, but my children were well aware that Mommy didn’t see well and couldn’t drive,” says Michelle. Blindness brought anxiety and panic attacks as Michelle lost the ability to care for herself and her family. Her husband Robert left his company job to work from home. At one low point, Michelle panicked on the way to her daughter’s siddur party. Robert attended the event without her. That’s when Michelle realized that for her children’s sake, she needed to get help. It took time to find the right doctor to address her issues. At first, doctors offered platitudes, dismissing her concerns with reassurances that “it is natural to feel anxious, having just gone blind.” But Michelle was determined to solve her panic disorder so she could take care of her family the way she wanted to, and continue her involvement in community organizations. She became president of the board of the local Jewish High School, and of a Jewish overnight camp. With the right care and support from doctors, family and lifelong friends, Michelle flourished despite her condition. “Since I went blind I have learned to ski, ride horseback, knit and do pottery,” says Michelle. Most important, Michelle created an environment where her children were able to lead normal lives. She even had a third child at 41, mastering the art of diaper changing while blind. Michelle says that it all made her kids “resourceful, independent, and resilient,” adding that her sense of humor and support system made raising them possible for her. Trained as a mental health professional, Michelle helps the newly blind face their condition free of charge. Michelle also promotes disability awareness at schools, from preschool through high school. When her daughter and later grandchildren attended Junior Gan Israel day camp, director Zeesy Posner invited Michelle to come and speak to the campers, developing sensitivity and awareness of what it’s like to be blind. Michelle published Close Your Eyes, a rhyming book aimed at helping small children learn about what it’s like to be blind, which has brought her more opportunities to speak to children. Michelle lets younger children in her presentations touch her cane and braille book, and plays games to show how blind people rely on hearing and other senses. There are some wonderful Jewish resources for the blind for learning Torah. Rabbi Yossi Shagalov of Torah for the Blind has been publishing Chassidus in braille and large print since 1992. The pamphlet Rabbi Shagalov distributes began as favor to help his chavrusa Avrohom Schwartzberg, who was legally blind and developed into Living with Moshiach, a publication that covers a wide range of topics including, “sichos of the Rebbe, halachos, inyanei Geulah u’Moshiach and information about the yamim tovim. The material is taken from L’Chaim, the weekly publication of the Lubavitch Youth Organization, thanks to Rabbi Shmuel Butman and Mrs. Yehudis Cohen. The pamphlets are printed in both large print type and braille, to serve the maximum number of readers. Living with Moshiach is mailed to every single library for the visually impaired in the United States, along with many nursing homes and facilities for the elderly. A bochur on Merkos Shlichus found an older woman with a copy in Wyoming, and asked her how she got it. She found the pamphlet in her local library for the blind. “It’s the only thing that gives me inspiration to be Jewish,” the lady confided. To read the Rebbe’s surprising take on blindness, and for more about Michelle, subscribe to Nshei Chabad Newsletter. Subscriptions must be received by Sunday, August 30, in order to receive this issue in the mail. visit our websitewww.nsheichabadnewsletter.com. The full e-version is available at Amazon.com and on Apple’s App store.